See what happens when you’re stubborn and refuse to enter the twenty-first century and get a smart phone? 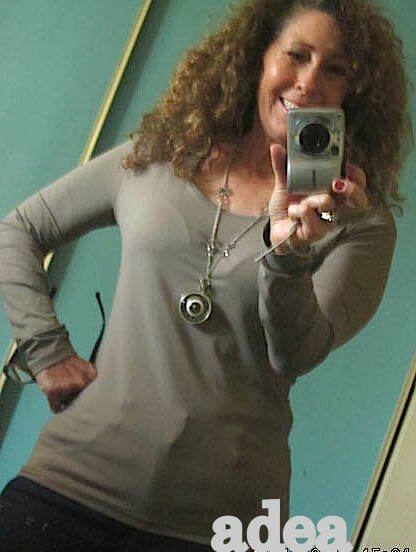 Resorting to an old school point and shoot to get a pic of me modeling this incredible Adea layering top. A wardrobe basic that’s fabulous, that’s for sure. At any age! Adea are well-made basics that last. The tanks, camisoles, and layering tops made from Italian-made fabrics transform into timeless silhouettes that contour to your body for a modern, feminine fit. They’re soft, machine washable, and include UV protection 50+. Adea uses an intelligent, stretch microfiber that gives all of their products the luxurious feeling of second skin. Fit for lounging at home or when you’re busy at work, for running around town or around the globe, these pieces will become an indispensable part of your wardrobe. This fall Adea launched a new, reversible camisole! Wear it as a v-neck or a scoop neck, whatever your outfit or mood requires. The reversible camisole will be available in two lengths, standard and tunic, for more layering choices and is made from Adea’s long-lasting, breathable, wrinkle-resistant fabric. The inch wide straps also offer coverage for most bra straps so the camisoles work as tank tops too. The Adea reversible camisole is a must-have wardrobe essential for women – travel with it, wear it to work, lounge with it at home, as a v- neck one day and scoop the next! Made in the USA and Italy. The fabric is SO soft and silky but doesn’t ride up — looks totally put together on its own or as a layering piece. It feels so luxurious! I especially love the fact that it’s 50+ UV protected. Adea sent me this product to try and review. This entry was posted in All Posts, Reviews and tagged Adea, camisole, Fashion, Italian made, layering piece, microfiber, UV protection, wardrobe essentials by Enchanted Seashells by Princess Rosebud. Bookmark the permalink. I am a bit hooked on JJill, myself. But your point(s) is(are) well taken. We have a JJill nearby, I haven’t been there in a while, I’ll check ’em out! Thank you! It’s a high quality item, that’s for sure.